“Two national insurers and a Michigan health system are joining a new pilot project aimed at simplifying physician credentialing with blockchain technology. “WellCare and Spectrum Health are among the founding participants in a pilot project launched by ProCredEx, a new company backed by Hashed Health, which specializes in blockchain and distributed ledger technologies for healthcare. To read the whole article, please hit this link. 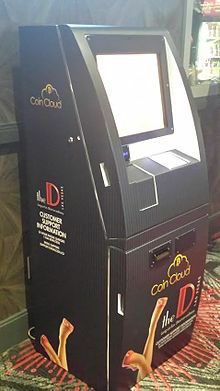 Bitcoin ATM at a Las Vegas casino. This link explains how a sister technology of bitcoin could change the future of healthcare. It’s a computer code called blockchain — the purportedly unbreakable security backbone of all bitcoin transactions. Mr. Winkelspecht told the news service that every time that patients see their physicians, they create wakes of digital activity that ripple through the care continuum, from the pharmacists who fill prescriptions to the pharmaceutical firms from which they order drugs.